President Trump this week signed into law a measure to overhaul the international mailing system in an effort to close a loophole that has led to the U.S. Postal Service becoming an unwitting courier for illicit drug manufacturers and contributing to the nation’s opioid crisis. Many lawmakers and stakeholders have pushed the reform for years, which will require USPS to receive “advanced electronic data” on the contents of international packages before they reach the United States, but the Synthetics Trafficking and Overdose Prevention (STOP) Act only made its way to the president after it was included in a package (H.R. 6) of dozens of other measures aimed at tackling the opioid epidemic. Supporters of the measure were hopeful it would help stem the flow of illicit, synthetic opioids from foreign manufacturers through the mail system. 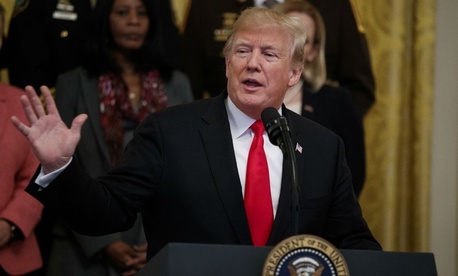 “The bill gives law enforcement the tools and resources they need to stop ultra-lethal—think of that word, ‘ultra-lethal,’ that's a big statement—drugs, like fentanyl, from being trafficked throughout our mail,” Trump said at the White House on Wednesday. The law will bring requirements currently enforced on private shipping companies to the Postal Service by 2021, when the mailing agency would transmit the advanced electronic data, or AED, to Customs and Border Protection on all international packages. USPS, which currently only collects the data on 40 percent of inbound international packages, would have to provide the information on 70 percent of packages by the end of this year. The agency would face civil penalties starting in 2021 if it continues to allow international shipments without AED to enter the country. Most foreign packages would face a $1 fee to cover the costs of additional customs processing. The measure will have far-reaching impacts across the federal government. CBP is responsible for inspecting the packages at USPS’ international mail facilities, though investigations can involve Immigration and Customs Enforcement’s Homeland Security Investigations, the Drug Enforcement Agency, USPS’ Postal Inspection Service and other federal offices. USPS, CBP and other agencies will now be tasked with collaborating to develop new technology to help customs officers better detect illicit drugs in the mail. The law will require the State Department to negotiate international agreements that require foreign countries to provide AED before sending packages. That provision could hit a snag, however, as the Trump administration earlier this month announced its intention to withdraw from the Universal Postal Union, the international mailing agency in which postal services around the world discuss collaborative issues. The administration has one year before the withdrawal is completed, and the White House said it hopes to remain in the agreement after resolving certain pricing issues. “We would prefer to stay within the UPU,” a senior White House official said last week when announcing the decision, noting, “It does provide some benefits.” The official added the UPU assists with the war on illicit drug trafficking, and the administration is working to maintain its access to advance electronic data whether or not it withdraws from the organization. The agency relies primarily on canine teams to find packages containing illicit drugs. Robert Perez, CBP’s executive assistant commissioner for operations support, told Government Executive in an interview last year that front-line personnel use analytics based on synthesized information gathered throughout the government’s law enforcement community to better identify what to look for when searching for illegal materials. That is coupled with and updated by CBP’s own observations in the field, as officers adjust to the ever-changing practices adopted by drug traffickers. Private carriers shipped just 50 million international packages in 2016, however, compared to 600 million shipped via the Postal Service. A recent USPS inspector general report found that 92 percent of websites the auditors examined that were offering illicit items on the “dark web” advertised that they shipped using the U.S. Postal Service due to its more relaxed standards. UPS CEO David Abney praised the new law for bringing parity between the requirements for the Postal Service and the private sector. The Postal Service itself has acknowledged the issue, but has declined to issue a full endorsement of the reforms. The bill is not without its critics, who at hearings over the last two years have said that many countries do not have the capacity to provide the advanced data the bill would require and its passage would effectively shut off the shipping of packages to the United States from those areas. Lawmakers, however, were optimistic it would do more good than harm.